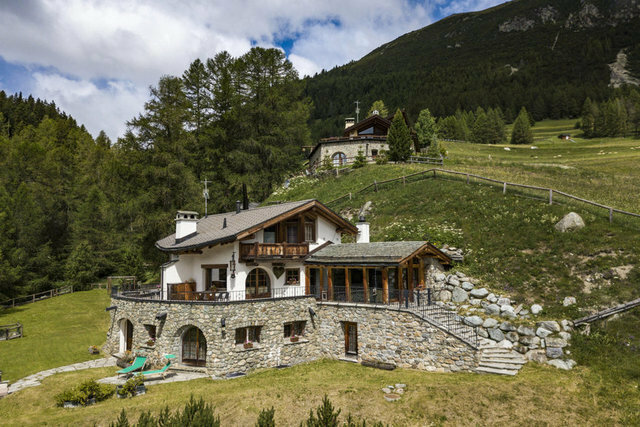 The “Chalet Chesarina” is a rare combination of privacy, comfort and space, situated in the area of St. Moritz, one of the most famous Alpine holiday destinations. The house is located in a panoramic place, a few minutes from the lovely village of La Punt. From the terraces you can enjoy a breath-taking view on the valley. The principal floor includes a dining area with a panoramic window and a wood oven, a separate kitchen, a living room with fireplace and a big internal terrace. On the first floor there are 3 bedrooms with private bathrooms. On the ground floor there is a private SPA and 3 more rooms (2 guest rooms and 1 extra room). Parking spaces available in the garage.